The air is blowing round and round the world. that was serenity inside, and outside, ferocity. This is my last post about Chesterown, I promise, unless by some good fortune or crafty planning I find myself back on Maryland’s Eastern Shore, hunting down crabcakes and old books. 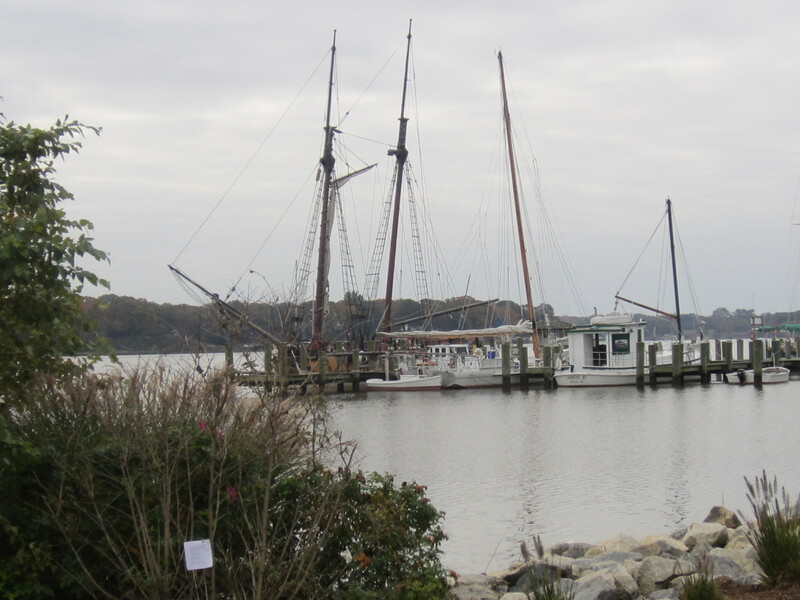 I left “Air,” with its evocation of violent storms at sea, on the peaceful banks of the Chester River. The Chester is hardly the Irish Sea, but there is a long history of crabbing and fishing here. Whether on the rocky coast of Scotland or on the flat fingers of the Chesapeake Bay, fishing is a hard, hard life. What I recall is leaving around midnight, and that following a traditional send-off from the wives and friends at the pub. I was advised, wisely, to be careful peeing off the side of the boat at night, because it would happen from time to time that a fisherman with too much grog in him fell in, no one knew, and was lost. I slept in a bunk below, not too far from the engine. The air was stagnant and smelled of petrol. Waking up in the middle of the night in a storm, I thought the boat was going to flip over from the rocking. I went on deck and there were two fishermen pulling in the nets full of fish, as if the weather was not an issue. I got seasick on the second day and they dropped me off at the next port. The fear my brother felt on that stormy night is the same fear the young boy feels in the central image of the poem. But the boy fears for his father’s safety, not his own. We parents always worry about our children. It’s startling to realize they worry about us as well. That “small loneliness” could break a mother’s heart. It takes me back to many a childhood night, lying awake with worries that were, mercifully, never realized. It’s the air, the air of a raging wind, that transports the poet back to childhood. The connection to his earliest years is accomplished not just through a sensory re-creation of past experiences, but through an actual physical encounter with air. The air he breathes today could be the very air he breathed as a boy. It could be the same air inhaled by people thousands of years ago, and by extension, the same his descendants will exhale for generations to come. In this way, air becomes a shared experience among people all over the world and people throughout time. Air is an element that unites, an element he offers his mouth to, as with communion. 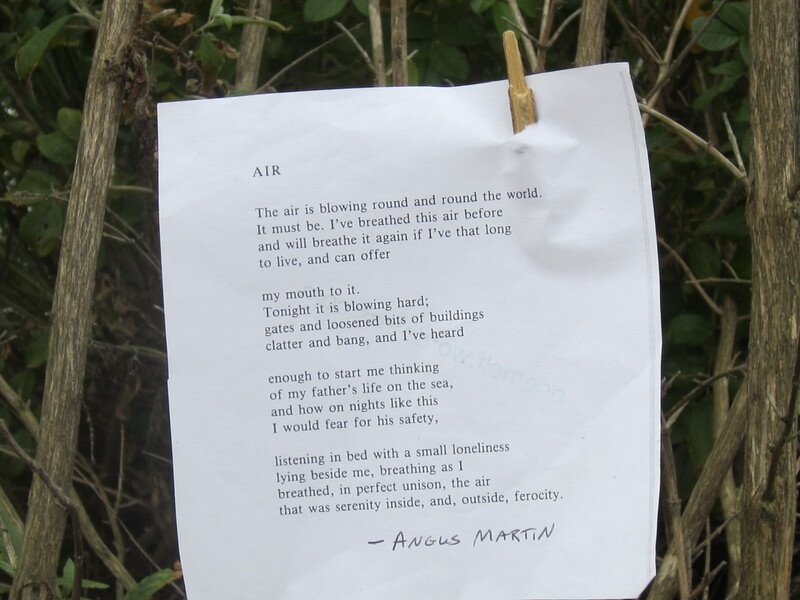 Angus Martin is a man of letters on many levels. During the years he’s worked as a rural postman, he has published many books of poetry and local history. He’s also an excellent guide for those lucky enough to hike with him.